Our friend Kent painted this picture. It has always lived in the kitchen. I’ve been trying to make a space for it, but for whatever reason – too many racks … no wall space – It’s been waiting backstage for an entrance. It’s getting colder, you see, and the mice are scrambling. We have a small mouse reeking havoc about the kitchen. Today has been operation kill mouse. Yes, kill. I don’t have the scalabiltiy to live-trap one mouse, take it three kilometers away and guard against its return. No, no, I will happily trap it in a fatal way because hey, it ate through my hot water pipe ( thank you Jan for fixing it! ) , it ate most of my pantry ( a bit of money to spend replacing there ) and the little penthouse and condo and vacation home it built … well, it stinks. So I re-did the kitchen. Oh so clean. We brought the barn cats in for extra coverage. In the meantime, at last, Kent’s artwork is back in the kitchen where it belongs. Now I feel complete. 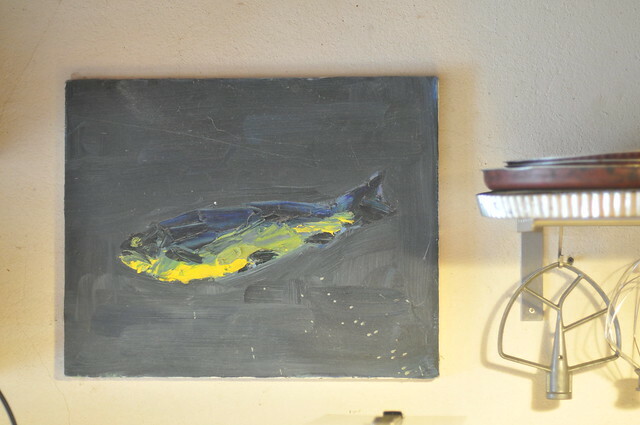 He said that he actually painted three fish, but only liked one. He then painted over the two he didn’t like and one fish remained. I really love this work. We often explain his process to the children when they try to paint something they are not satisfied with. Look dude, just paint over that and leave what you love.